Aspiria is proud to have formed many solid relationships with brokers and advisors. Unlike other organizations in our industry, we are the only EAP and SAP provider in Canada that offers customized services based on your customers’ unique needs. We are singularly focused on delivering robust programs, quality counselling and specialized services through our highly accessible, flexible and unparalleled customer service team. As your EAP/SAP provider we are committed to fostering a relationship with you so that you in turn can provide a trustworthy, quality and progressive EAP/SAP service to your customers. Backed by decades of professional expertise and quality care, we help you bring quality EAP/SAP services to your customers to mitigate the risks associated with employee wellness in the workplace. We enjoy working with a variety of teams, talents and industries to bring your clients the best wellness solutions tailored specifically for them. When you work with Aspiria you can guarantee you’re presenting the most suitable solution for your clients’ business. When you work with Aspiria you can guarantee you’re presenting the most suitable solution for your organization. If you are interested in working with us, or would like to discuss the preparation of an EAP/SAP quote for one of your clients, please complete the form below and one of our team members will get back to you within the same business day. I understand by clicking on this box, I am providing my express consent to receive electronic communications including emails about new services and promotions from Aspiria. I understand I may withdraw my consent at any time by emailing Aspiria. Personal problems that spill into the workplace can cause stress, lower productivity and even create uncomfortable situations for co-workers and colleagues. From absenteeism to sick leave abuses and high employee turnover to distractions and even damage to company property, the overall well being of your employees can be an asset to your organization’s growth. If your company is like many today, rising healthcare costs and personnel issues can threaten your financial and human resources, causing job performance issues that ultimately impact on your bottom line. 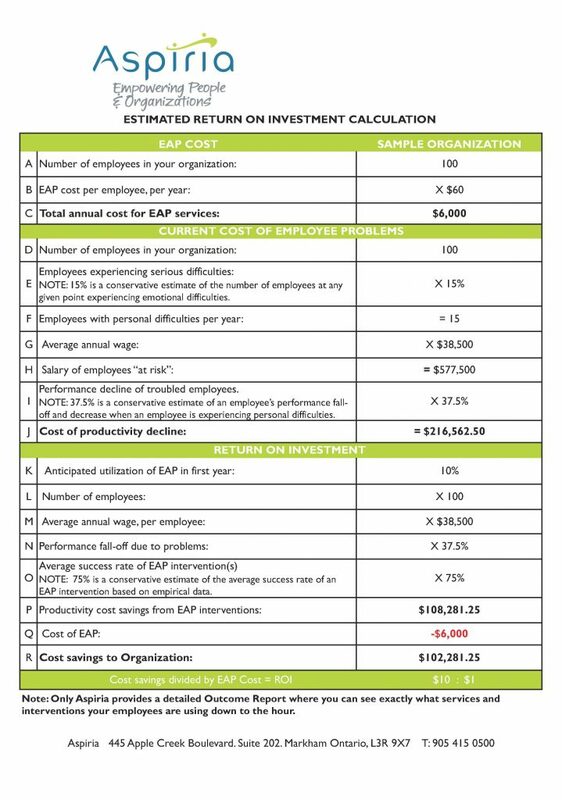 In order to help you through the decision-making process regarding the purchase of EAP services, we have provided this Worksheet for you to calculate the approximate cost of services and potential return on investment (ROI) for your organization. The only values you need to enter in the ROI calculator are: number of employees in your organization, the average annual wage in your organization, the anticipated utilization of the program, and, the cost of the program.